Platt is a hedge fund manager (BlueCrest), but he says he doesn’t want anyone thinking he’s just a money machine who’s given up on real life. He told This Is London, that he’s “passionate” about art; he’s not a shrivelled financial soul. We never thought hedge funders were shrivelled financial souls. But this guy did: Joe la Placa, a famed art gallerist who was an assistant to artists Lichtenstein and de Kooning. He also co-wrote the screenplay of the Jean-Michel Basquiat film, Basquiat. 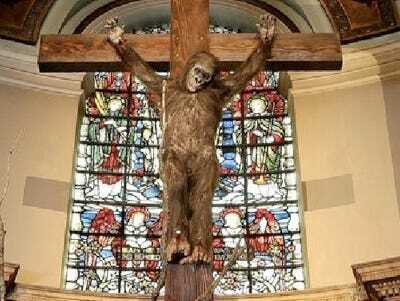 Now the two own All Visual Arts (AVA), an art business through which Platt and la Placa pick artists and fund art projects that the artists couldn’t afford to do on their own, like the crucified gorilla. Then they either hold on to them or they sell them. Platt isn’t the only hedge funder who’s into art. Check out what Julian Robertson and Steve Cohen own.